City directories were created for salesmen, merchants, and others interested in contacting residents of an area and are a valuable research tool to trace individuals, families and businesses. 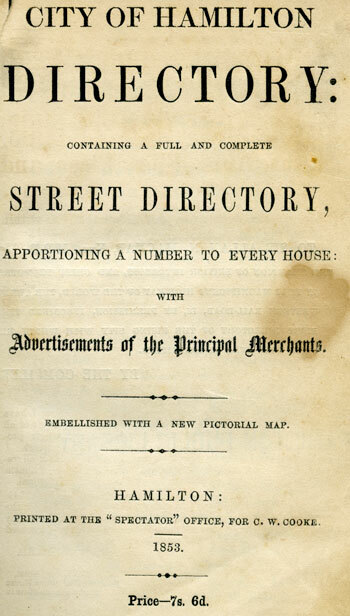 Directories were published annually and provide an alphabetical listing of the adult residents, with their occupation and address, as well as an alphabetical listing of streets, with the occupant at each house number. The directories also include listings of businesses, institutions, churches, schools, social organizations, and municipal services. The Hamilton Public Library’s collection of City Directories cover the City of Hamilton Directory from 1853 to 2013. Suburban directories are also available for Ancaster, Burlington, Dundas, Stoney Creek and Waterdown from 1957 to 2013. Earlier Hamilton directories include suburban areas and smaller townships and villages; please see the guide for townships and villages. Hamilton Public Library is currently digitizing all of the Hamilton City Directories in its collection. To access fully searchable and downloadable digital copies, visit the Local History & Archives site on Internet Archive. Make sure to check out this site regularly, as directories are constantly being added. Copies of the city directories are also available on microfilm in the Local History & Archives Department which is located on the 3rd floor of the Central Library. Please contact Local History & Archives for more information.